Today I started writing this blog-post after testing Powerset, using human questions about Macedonia (a well-known SEMANTIC dispute between Greece and another Balkan state). After all, the infamous «naming dispute» between Greece and the Former Yugoslav Republic of Macedonia is -to a large extent- a SEMANTIC DISPUTE. 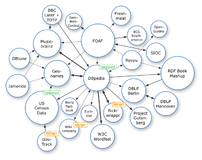 I am a registered beta-tester of the Powerset Semantic Search Engine (www.powerset.com) , where one can ask human questions and get (more-or-less) human answers, based on Natural Language Processing (NLP) from a Knowledge-Base that uses Wikipedia. Semantic search-engines are multiplying faster than rabbits! 🙂 Two months ago, a Semantic Web Search Engine Roundup was posted by James Simmons. Among these, Natural language Search Engines are perhaps the best. Question 1: What is Macedonia? Question 2: Who are the Macedonians? Question 1: «Macedonia» can mean a «geographic region», OR a sovereign state (F.Y.R.O.M), OR a large province of another sovereign State (Greece), OR an an ethnic identity (of Macedonian Slavs) OR another (very different) ethnic identity (of Greeks from Greek Macedonia), OR an Ancient Empire (of Alexander the Great), etc. Question 2: «Macedonians» can mean anyone among a variety of identities: Greek Macedonians, Slav Macedonians, Albanian Macedonians, Bulgarian Macedonians, even Jewish Macedonians (and other ethnic groups that live -or have lived- in the region of Macedonia). You can experiment with more natural language questions, e.g. «Who was Alexander the Great», or «Where did Macedonians come from», or «Who are the real Macedonians». (After I collect more results, this post will probably be updated). WARNING: This is a new search engine technology, and (although Natural Language Processing has existed for more than two decades) it can sometimes go wrong. So, expect impressive results, but also a lot of mistakes! Unfortunately, the second search-engine (www.ask.com) appears to be considerably biased, in the naming dispute, in favour of Slav Macedonians. However, before condemning it, consider the possibility (almost a certainty) that the cause of this is not the fault of the search-engine itself, but the overwhelming propaganda presenting inhabitants of FYROM as the ONLY «true Macedonians»! So, why is Powerset more unbiased? -Probably because it is based exclusively on ONE source (Wikipedia) where the balance between the 2 sides is better than in the whole World Wide Web (sadly for Greece). Only a few dozen results have been uploaded from Powerset. More results will be uploaded in a short while. Unfortunately, the Powerset Natural Language Search Engine is only available to registered Beta-testers, at the moment. The results can’t be accessed directly in public. They are instead uploaded by hand, via ftp to my site. I am also a registered tester of the «TrueKnowledge» Semantic Search Engine (based in Cambridge, UK). New posts about this will probably appear in this blog, in the next few days. Previous Kemos the Balkan BORAT, 100% genuine Arvanite! they have all sorts of naming problems in greece. on one hand, we have to nations fighting over the name macedonia while on the other, we have a group of island dwellers from lesbos and a group of female homosexuals fighting over who should be called lesbians and who shouldn’t. what is in a name anyway? Well, you are right about «all sorts of naming problems in Greece». Having lived in the UK for many years I do NOT share with the average Greek this kind of extreme sensitivity. I am only worried in case THIS naming problem (the Macedonia dispute) has serious bad side-effects on many other issues that the average «name-worrying Greek» does not even imagine. The EXTREME STUDIPITY of insisting on an irrational view like «Macedonia is (only) Greek», is what causes the worst problem, since in this way no decent compromise can succeed, the problem will remain and get worse with time, and Greece will lose even… financial copyrights as regards the term «Macedonia». As regards the other «naming problme» in Lesvos, I think this is the absolute ULTIMATE in typically Greek stupidity, and if we really look into this silly problem deeply, we will realize the silliness of all the other problems, of nationalist fanaticism in Greece. (In other blogs I opposed these closed-minded Lesvian fanatics). BTW, the island of Lesvos is not LESBOS. I.e. the problem does not exist, since people from Lesvos can be simply called «LESVIANS», instead of «LESBIANS»!!! How come I didn’t realize this till now?